We have so many party invitations and fun activities especially from this weekend onward. As always, we are unable to attend all of them and it's so difficult to choose which ones we could attend, and which to politely and regretfully pass. I made this simple bat bento which includes a couple of bat shaped sandwiches. For these I used my larger bat shape cutter and added eyes and mouth cut from fruit leather. Above these bat sandwiches there are organic carrots and celery sticks with a BOO pick, and to the left of those are some bat shaped pieces of mild cheddar and mozzarella cheese. I used the same small cutter for both the cheese and the cut-out of the apple half. In the center are Annie's organic fruit snacks. Perhaps dark pumpernickel bread might have been more typically bat like, but what I used here seems to make the little red eyes a bit more startling. This lunch was packed in a Planetbox Rover. My hubby thought that the bats should be upside down as he said that is how they are usually seen. While it might have been extra creepy for those who know such things, I suggested that they probably do their flying orientated as shown. I actually looked this up, and there indeed are white winged vampire bats and while they do hang around upside down they don't do it with their wings spread. Spooky to me!! What a fun lunch! My kids would love this! 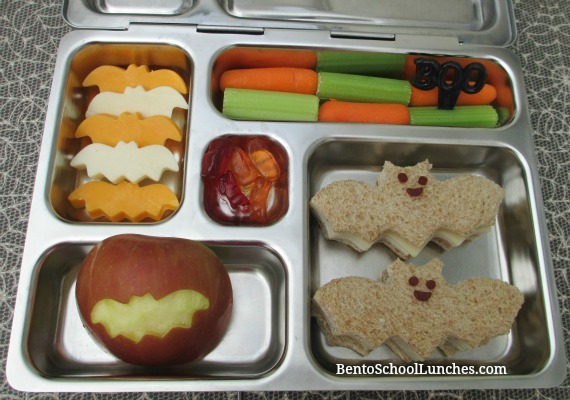 Such a fun bat bento! Love these cuties :) Have a great weekend! Thank you so much Ming!